Hybridizer is a compiler that lets you run a single version of your C# or Java code on any harware. 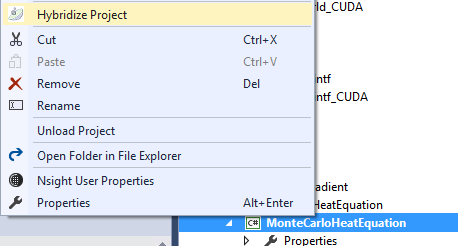 In this tutorial, we will explain how to create a first project in C# targeting GPU. We will illustrate with hybridizer essentials. Visual Studio 2012, 2013, 2015 or 2017. Warning, in Visual Studio 2017 with CUDA 9.2 or earlier you need to install v140 toolset from Visual Studio Installer. Ensure your Visual installation supports C++ and not just C#. You need to request a Hybridizer Subscription. Subscriptions are our new licensing model for Hybridizer Essentials. They can migrate from one machine to another (only one machine being authorized at a time). Trial are unique and attached to your email address, while you can purchase as many commercial subscriptions as you want. You should receive your license in your mailbox soon. If not, please contact us or create an issue on github. Paste this text in the license textbox in Hybridizer Configuration, and click Refresh License. Build C# project, then native generated project, and run. First create or open and existing C# console application. This step will create a native CUDA project and add it your solution. It will handle the files generated by Hybridizer from your managed C# project. Your C# project now references Hybridizer.Runtime.CUDAImports. This assembly provides all the necessary attributes to hybridize methods, a CUDA wrapper, and a memory marshaller. We will come back on those in later posts. A native project has been created and added to your solution. This project references two files, hybridizer.generated.cpp and hybridizer.wrappers.cu. The first one will contain a cubin module. The second will export native symbols. If not already existing, an x64 platform configuration has been added to your solution. Before building anything, change configuration to x64. 32 bit support is indeed being deprecated by NVIDIA, and nvrtc requires 64 bits. hybridizer.generated.cpp contains a big array of bytes, which is the device code of your kernel. Congratulations! You just successfully ran your first C# kernel on the GPU! Our hello world is the addition of two vector of elements. The C# code is downloadable from our github. As usual, we need to invoke this method with some boilerplate code. Explicit work distribution can be used (for example) to distribute work among a 2D-grid. It’s often useful to use intrinsics or builtin functions provided by CUDA. You might also already have a very optimized cuda header which you’d like to reuse from your C# application. This can be done using IntrinsicFunction attribute. When generating the source code, the function call is replaced by the IntrinsicFunction name, and the contents of that function is ignored. The C# implementation of Erf is too simple to be bug free and accurate. It’s better to rely on the CUDA implementation. To do that, we decorate the C# function with the IntrinsicFunction attribute. Hybridizer will get the name property of that attribute, and replace calls to Erf by calls to the native erf function from cmath. Sometimes, we already have a good native CUDA implementation of some function. In that case we don’t want Hybridizer to process our C# symbol. We rather want it to use the one we provide in a custom header. The IntrinsicInclude attribute on the class will tell the Hybridizer to include this header in the generated file. The C# version of myfunction won’t be processed and myheader.cuh will be included. It is also possible to use/integrate existing libraries for which device functions are defined, hence extending the concept of intrinsic functions to intrinsic types. Note that in that case, the functions do not need an implementation if no behavior is expected in plain C#.